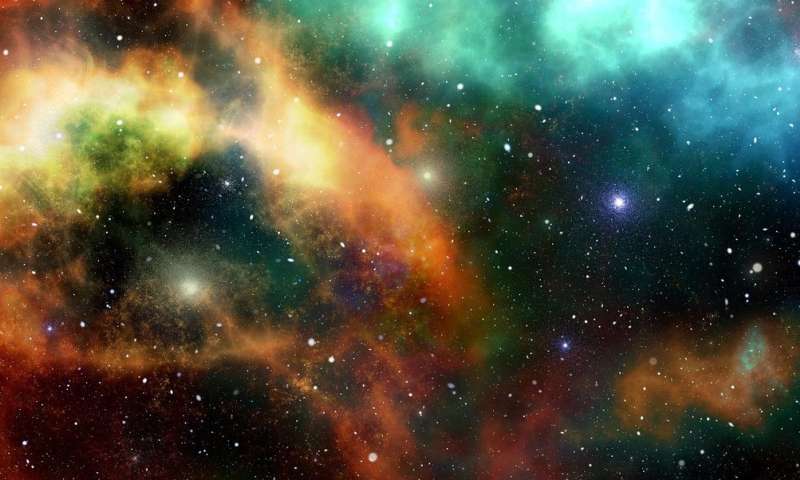 "If star formation happened rapidly, all stars would be bound together in massive clusters, where the intense radiation and supernova explosions would likely sterilise all the planetary systems, preventing the emergence of life," he said. "The conditions in these massive star clusters would possibly even prevent planets from forming in the first place." "The phenomenon we studied occurs in galaxies and star clusters where there's a lot of dusty gas that is forming heaps of stars relatively quickly," Dr. Crocker said. "In galaxies forming stars more slowly—such as the Milky Way—other processes are slowing things down. The Milky Way forms two new stars every year, on average." Dr. Crocker said the study's mathematical findings indicated the phenomenon set an upper limit on how quickly stars can form in a galaxy or giant gas cloud. "This and other forms of feedback help to keep the universe alive and vibrant," he said. "We are investigating other ways stars might feed back into their environment to slow down the overall rate of star formation." After a quick browsing: the paper seems to say that the initial radiation/matter balance drives habitability. FWIW, that could possibly be more evidence for a multiverse, since the balance is finely tuned to leave some matter after hot big bang matter/antimatter annihilation. This is just hilarious but also sad!!! They are now using the precise reason that stars CANNOT form by themselves in the first place ( the Jeans Mass Limit ) to say that it is also responsible for the emergence and continued existence of life!!!! The mixed up reasoning is just absurd. Stars cannot form by themselves because the internal pressure from heat build-up prevents gravitational collapse to trigger fusion. So they then latch onto dark matter as a way to provide the required cooling so the gas can contract and finally reach the required tipping point to trigger fusion. Now they classify the original problem as a solution that allows life to exist. Bizarre!